Squad Conquest, a more concentrated version of the 64-player Conquest mode, is coming to Battlefield V™ as part of Chapter 2: Lightning Strikes but will only be available from January 17 to January 30. New multiplayer mode played under Conquest ruleset. Features 16 players total: eight players per team, broken into two Squads of four. Fight to control three Flags. 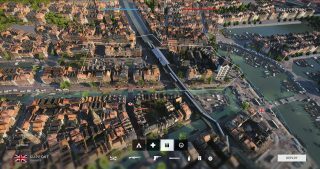 Playable on condensed versions of the Arras, Rotterdam, and Hamada maps. Available only during January 17–30, for now. Two opposing teams of eight compete to capture and hold every flag in this strategic version of Conquest, until they exhaust the enemy team of their Respawn Tickets. You and your squad must fight point-to-point in this 16-player Conquest mode, working to gain control of three key locations across three faster-paced multiplayer maps. This new mode reconfigures the battlefield to encourage a more tactical playstyle, allowing for a single player to have a larger impact on the match. These strategic maps contain more defined lanes of battle and smaller combat areas, which means that it's more important than ever to predict where the enemies are coming from, what needs to be defended, and how to subvert enemy movement. 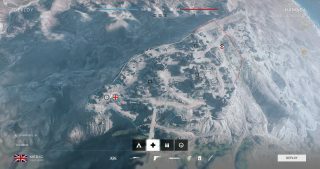 Squad Conquest is set up on versions of Arras, Rotterdam, and Hamada. Each map is different, but all feature two teams total, three flags to fight over, spawns on team flags , and very limited access to vehicles. Let’s dig in to each map. This version of Arras has a triangle of objectives, where Flags A and C are closest to a respective team’s headquarters. Flag A, the Bridge, is next to the Axis HQ and is comprised mainly of a bridge as well as a small building to maneuver from. Flag C is the Water Mill, nearest the Allied HQ, and contains long two-story building that can be heavily fortified. The third piece of the Flag triangle overlooking the other two capture points is Flag B, Ruins. Owning this point offers a significant visibility advantage, as it is situated on ruins at the top of a slope. Much of the hectic battles will likely take place on routes to and from Flag B. The path between Flags A and C can be used to fire from cover such as the trees and bushes along the country road and riverbed. Although this covered route is an ideal flank path, soldiers must be wary of fighting from the low ground should they be engaged by the enemy. 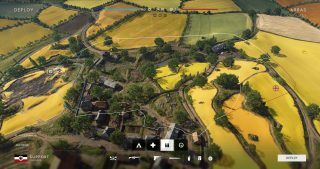 Arras is the largest of the three Squad Conquest maps and allows one tank per team. The Squad Conquest Hamada map shares the ruinous landscape of its regular counterpart but is designed with a much smaller area of battle in comparison. Flags A and C are located on two of the larger structures with Flag B fixed on the bottom floor of a large temple. Flag A, Bridge, is situated nearest the Allied HQ, the skeletal remains of ancient buildings and a snug layout primed for infantry ambushes. Immediate to the Axis HQ is Flag C, Desert Ruins, found on the edge of a barren landscape of gravel and bare rock. The highly contested Flag B, Temple, is an infantry trap at all levels. Barbed wire and sandbag Fortifications control access to the flag, but higher levels provide elevation for defenders to launch surprise attacks. Despite its abbreviated layout, Squad Conquest on Hamada offers a variety of strategic arrangements in a compact package. An abundance of routes and verticality shifts the power balance with the two vehicles – one tank per team – and they will need to be supported by smart ground troop movement to effectively help their team win. The smallest map of the three, Squad Conquest Rotterdam is also the most intense. Linear battle routes are mapped from two key locations from the regular Rotterdam map, ditching the triangle layout found in the other two Squad Conquest maps. Each Flag just about lines up next to each other, with the Axis HQ located away from but between Flags A and B. The Allied HQ is closest to Flag C, White House. A spacious park on the west side is home to Flag A, Plaza, and is surrounded by multiple-story buildings. It faces Flag B, Train Station, head on. It's a slightly modified version of Train Station Beurs found on the larger Rotterdam map and the point sure to collect the heaviest number of casualties. Flag C is nestled outside the large White House, where Allied forces will start their advance and clash with enemies at the Train Station. This map was designed with three distinct lanes for firefights: middle, upper, and canal. Consider it a highly tactical layout built with the most competitive Battlefield players in mind. It features the most direct head-on combat with one armored transport vehicle only available if the opposing team owns all flags. However, this map offers plenty of paths to flank the enemy team.